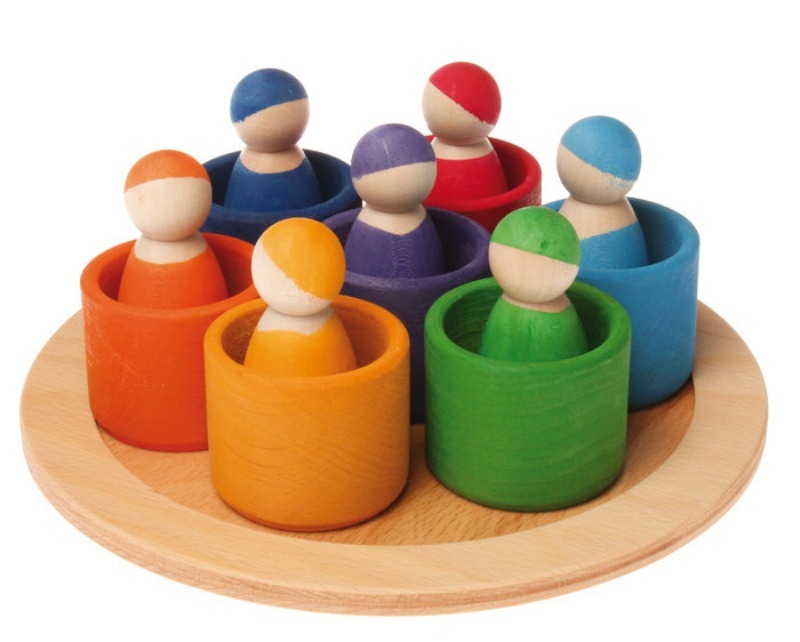 6 Wooden Balls, perfect for playing with the Rainbow and the Large Set of Boxes. Children can sort the colours, use as marbles or create paths for the balls to follow. Each Grimm’s toy has unique markings on them due to the natural grain and knot marks found in wood. These natural markings make each product one of a kind. They are not flaws but rather enhancements, unique markers of nature and an inspiration for play. Children often draw inspiration for play from these natural features. The distinctive variations found in each Grimm’s products are a testament to their natural origins, proof of the toy’s quality, and are not a defect. Grimm’s wooden toys are inspired by Rudolf Steiner, an Austrian educational philosopher and they have been developed to promote open ended, creative and sensory play. Every toy has a soft tactile finish as a result of Grimm’s using a colour glaze that penetrates into the wood, rather than leaving a glossy protective film on top. Grimm’s uses only natural colour stains and oils and ones that are recommended for use on children’s toys. Grimm’s uses environmentally sustainable practices in all of their manufacturing and all wood used is sustainably sourced using European woods – lime, maple, alder and cherry. They use minimal packaging to honour their environmental ethics.